Hygiene is an issue that affects us all. Since wherever people meet, illnesses may be spread – in large part by their hands. 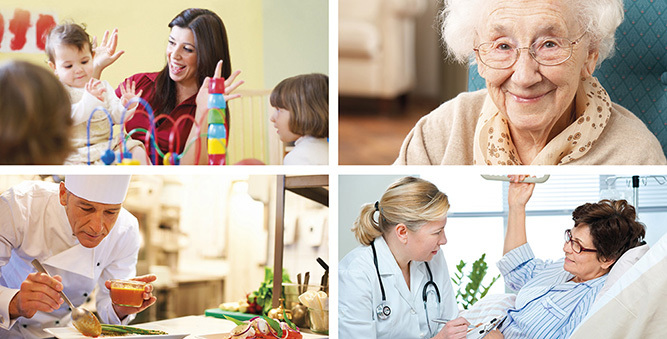 Thanks to SecuSan®, infections transmitted via handles touched by everybody can be effectively stopped. SecuSan® is an antibacterial and antimicrobial surface for door and window handles. It provides active protection against the spread of germs and bacteria. 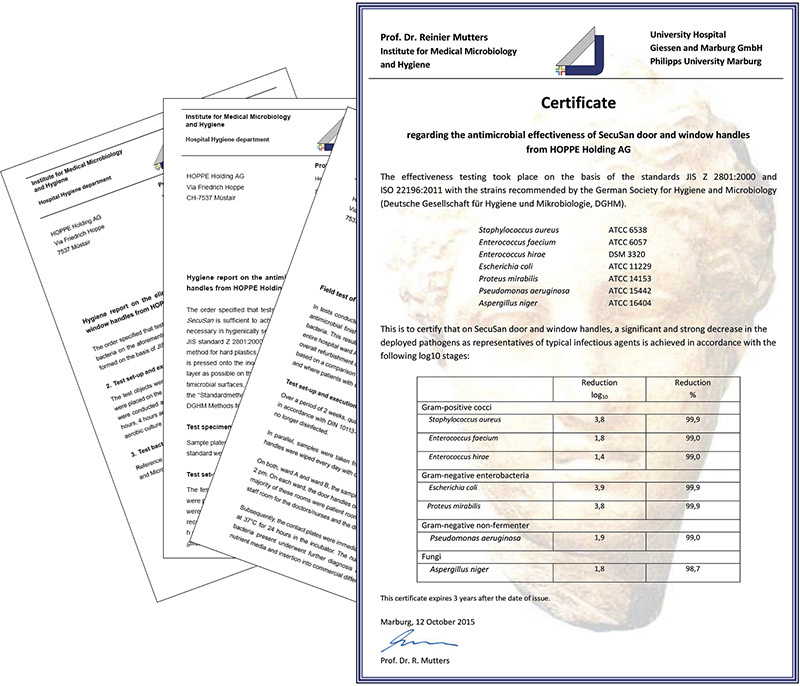 SecuSan® immediately and permanently suppresses the growth of pathogens on the handle, as confirmed by independent lab and practice tests. Our film shows you how SecuSan® works. 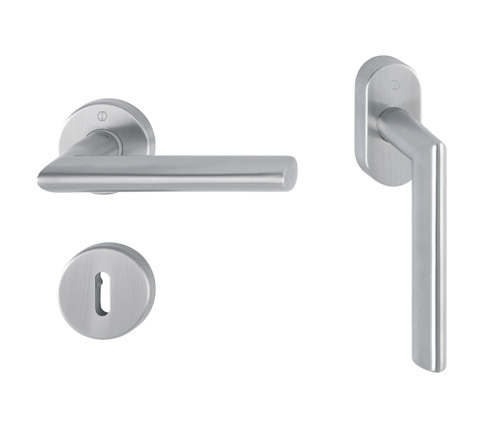 The coating on the SecuSan® handles contain silver ions that prevent the growth of germs. The silver destroys the cell membrane of the germs and therefore blocks cell respiration and cell ingestion. Cell division stops; the germ dies. Independent tests have shown that SecuSan® reduces the growth of germs in this way by more than 99% – even with regular cleaning, and it requires no maintenance. Silver ions destroy the cell membrane of the germ. There is a significant reduction in the bacterial load on the surface. SecuSan® handles are available in an array of different shapes and designs for interior doors and windows. A small selection is shown below. 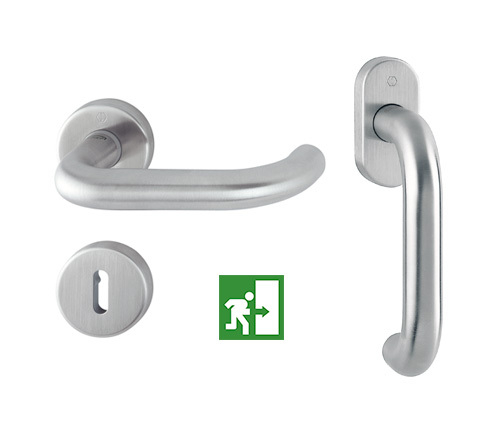 All the series shown are available in aluminium and stainless steel. 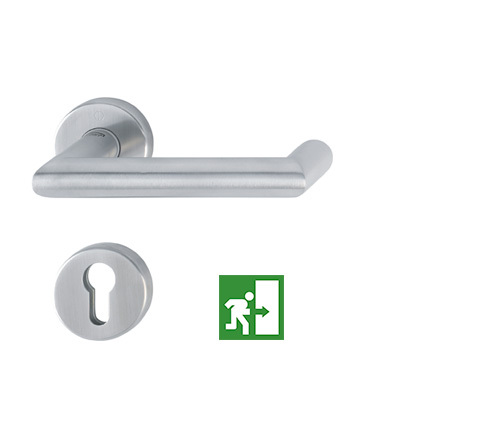 Instead of handle sets on rose with escutcheons , versions are also available with a backplate. 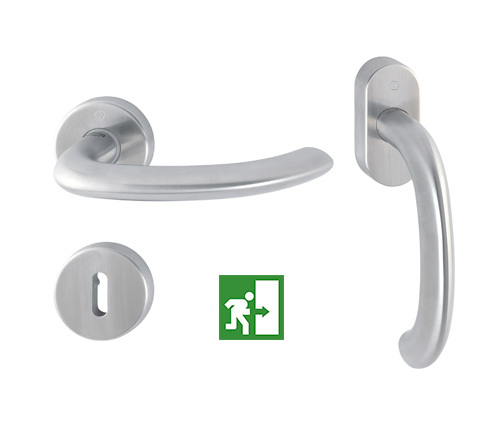 What is more, each handle shape pictured is also available as a fire-resistant or panic version. SecuSan® products are suitable for interior applications only. The HOPPE company, run by the owning family, with more than 2,800 employees at seven plants in Europe, the USA, and international distribution, is the European market leader in the development, manufacturing, sales and marketing of hardware systems for doors and windows. Liability note: Although we take great care to check the content, we do not accept liability for the content on external links. The operators of these sites bear sole responsibility for the content of the linked websites.